Introducing Force/Collide's signature planter in flat black. Using a seamless brake-forming technique, one sheet of steel is wrapped into a unique geometric pattern that's triangular at the top and hexagonal at the base. Three V-shaped legs perfectly elongate the basin's lines to create a stand-alone piece of furniture. For ultimate versatility, the Deca Planter is fabricated with optional drainage and powder coated for indoor or outdoor use. Each one includes a 1/2-inch hole in the bottom, along with a sheet metal plug that seals to stop water. Flat black has a velvety, matte texture that reflects little light and emphasizes the faceted, geometric nature of the planter. The perfect modern accessory that compliments any color palette. Available in four sizes and nine colors (see below). Mini and Small sizes are best for succulents, flowers or small house plants to be perched on a tabletop, mantel or windowsill, while the Medium and Large sizes are great for a range of house plants, shrubs, small trees and sit on the floor. Introducing Force/Collide's signature planter in flat black. Using a seamless brake-forming technique, one sheet of steel is wrapped into a unique geometric pattern that's triangular at the top and hexagonal at the base. Three V-shaped legs perfectly elongate the basin's lines to create a stand-alone piece of furniture. For ultimate versatility, the Deca Planter is fabricated with optional drainage and powder coated for indoor or outdoor use. Each one includes a 1/2-inch hole in the bottom, along with a sheet metal plug that seals to stop water. Flat black has a velvety, matte texture that reflects little light and emphasizes the faceted, geometric nature of the planter. The perfect modern accessory that compliments any color palette. Available in four sizes and nine colors (see below). Mini and Small sizes are best for succulents, flowers or small house plants to be perched on a tabletop, mantel or windowsill, while the Medium and Large sizes are great for a range of house plants, shrubs, small trees and sit on the floor. AVAILABLE COLORS: Glossy White Glossy Maroon Flat Black Flat Light Pink Flat Pastel Green Green Sunbeam Salmon Pink Sunbeam Bluegreen Sunbeam Daffodil Yellow AVAILABLE SIZES: Mini: 5.25 x 4.5 x 7.25" Small: 7.75 x 6.75 x 10.75" Medium: 12 x 10.25 x 16.5" Large: 13.5 x 15.5 x 22.5" Posted lead times are for quantities up to five Deca Planters. For lead times on greater quantities, please inquire. Force/Collide was created in 2013 by Seattle-based metalsmith Chelsea Gaddy as a platform for building high-end furniture and architectural works. Our design is rooted in a mix of distinct geometry, the attitude of clean minimalism and dramatic materiality; the process, always in the upmost care for quality and integrity. Our fabrication process demands attention to detail and refined technique at every stop, treating each piece as an heirloom to future generations. We strive to push the boundary of possibility while meeting every parameter of function and design. In 2016, Force/Collide was selected to exhibit work in Bellevue Art Museum's Biennial: Metalmorphosis by a distinct jury among 49 metalsmiths from the Pacific Northwest, as well as the group shows "Women in Metal" at Pratt Fine Arts Center in 2015, "Urban Smiths" at HyBrid Architecture in 2017 and "BUILT" at American Design Club for NYCxDesign in 2018. Owner Chelsea Gaddy was asked to speak in a panel discussion in conjunction with "Women in Metal" at Cornish College of the Arts and has been a featured artist in City Arts, Craft & Culture and Project Girl Crush. In 2018, Force/Collide received a Carol Duke Artist Award of Excellence at Bellevue Arts Museum Artsfair in 2018 for our line of Deca Planters. 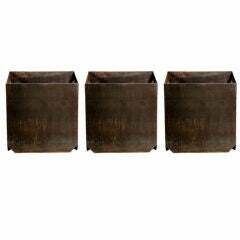 Set of three large 'Cubiste' patinated steel plate planters by Design Frères. Holes for drainage on the bottom. 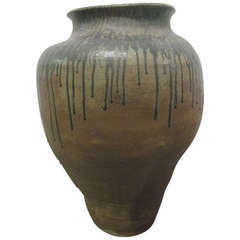 Paul Chaleff large-scale stoneware planter. Fantastic rectangular planters by Willy Guhl. Great for succulents and indoor planting. 7 still available. Priced individually. Fantastic square tabletop planters by Willy Guhl. Great for succulents and indoor planting. Four available. Priced individually.